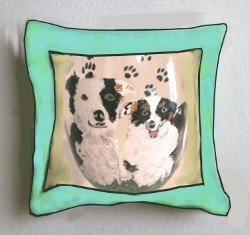 Make hand painted dog pillows a part of the family. We have photographs of our children why not of our dog with hand painted dog pillows. Let's face it our dogs are our best friends, part of the family. Put fido on the couch next to the table with pictures of your children. Our hand painted dog pillow is made of beautiful cream ivory fabric and the color and the details go into the face of your dog. You choose the color of the back of the pillow along with either fringe or cording. Your painted dog pillow will be custom made just like you want it. Include a picture when ordering so this pillow is a true depiction of you precious dog. We also hand paint dog wine glasses, dog Christmas ornaments, dog plates and platters.